The HandWritingToText controls translate the text written with it's hand by the user into "computer text". The final purpose is to triggers some actions when a specific keyword is recognized and it'll so be able to recognize only one word at a time and not a whole text. It is delivered into an assembly which can be used in any WPF project. We will follow all the tips and tricks given in this previous post : How to create your own control library. The template of our control is pretty simple because it will be constituted of one single element : an InkCanvas. 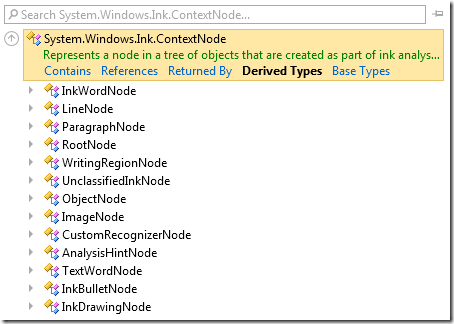 This control is a Template part that we name PART_theInkCanvas. An InkCanvas is simply an area that receives and displays ink strokes. You may only wants to recognize the words and not display what the user writes : to do so you’ll only have to set the strokes color to Transparent. But this is not as simple because you have to set the property on the DrawingAttributes of the inkCanvas which is not bindable because this is not a DependencyObject. So the solution I found is to add a dependency property “StrokeColor” on the control, and to set via the code-behind the color on each change of this property (the color must also be set when the control is loaded). The code is very classic and I let you dig in the source if you want to see it ! Then comes the funny part : analyze the drawed strokes and find the real words behind then ! It’s here that the IAWinFX DLLs take all their meaning by providing the InkAnalyser class. This is a very nice tool which analyses the strokes you feed him with and returns you what it recognize. The AnalysesMode which is how the ink analyzer behaves before, after and during the analysis. In our case we want it to clear the cache automatically and to start the reconciliation process right after it had finished his recognition. To get the strokes entered by the use we only have to get the InkCanvas from the template in the OnApplyTemplate methods and subscribe to its StrokeCollected event. Then in it's handler we’ll be able to feed the ink analyser. But wait… If we let the user play with the component and writes whatever he wants to, the ink analyzer won’t be able to recognize any pattern : it will only be a child drawing for him ! How to get the results of the analysis ? Everything takes place in the handler of the InkAnalyzer ResultsUpdated event. The argument of type ResultsUpdatedEventArgs is first used to find if the analysis is successful by using it’s e.Status.Successful property. If there is some results we then have to get the inkAnalyzer to get them. InkWordNode : represents a collection of strokes that make up a logical grouping that forms a recognizable word. The text can be found via the GetRecognizedString method. 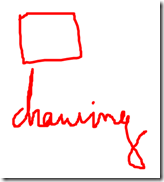 InkDrawingNode : Represents a ContextNode for a collection of strokes that make up a drawing. For example it can represent a Rectangle, a Circle or any geometric shape. 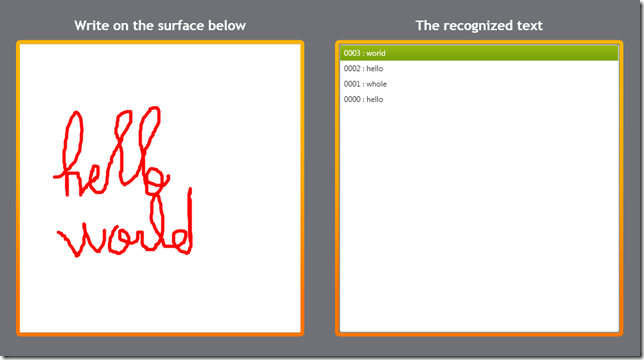 The shape can be found via the GetShape method on an instance. LineNode : Represents a ContextNode for a line of words. One more thing I faced in testing this control : it worked very nicely on my laptop but it was not recognizing a word on my another home computer. It take me a little time to figure out what was the problem : one computer is in English and the other is in French. Using the ink analyzer can lead to memory leaks and freeze when exiting the application so you have to be careful to clean-up all the used resources. To do so I make the control implement the IDisposable interface and call in it a method named ClearResources. How to use it in your application ? Register to the TextEnteredEvent or bind yourself to the LastRecognizedWord property of the control. Where to find the resulting control ? Nice One , Thanks man.